Fr. Ailbe O'Reilly, ORC:Fr. O'Reilly addresses both the skeptic and the over-enthusiastic devotee of the holy angels. 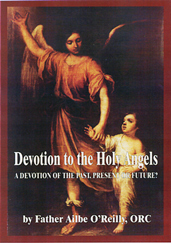 Drawing comparison from the True Devotion to Mary of St. Louis Marie de Montfort, he explains Biblically in what true devotion to the angels consists.